With the increasing threat of hacking, data loss and security breaches, blockchain is in many ways setting a whole new standard for all types of transactions and business interactions. Thanks to the level of security it can offer, blockchain allows organisations to not only place complete trust in their own data but to also extend that trust to customers and suppliers. This uncompromising trust is fast becoming a powerful competitive advantage for organisations that are adopting blockchain. Contract handling has quickly become an area of huge potential business benefit with blockchain. For many businesses, the products and services they offer depend on sub-contracts and deliverables from partners, suppliers and contractors - often in a chain of several agreements along the way. 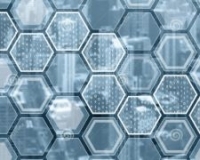 By using blockchain technology, the business can provide the end customer with a transparent overview of the product as it moves through the supply chain. If a delivery is delayed or a product is defective, it can be quickly determined which part of the chain has failed and corrective action can be taken. This can help to provide clearer terms of engagement, as well as establish financial liability for all members of the contract chain. Blockchain technology is of course already used for high-privacy transactions in the world of finance and is highly trusted with sensitive data. This makes it ideal for protecting contractual information. In many cases, there are elements of a contractual agreement that should not be readily available for all members of a supply chain to see. This could be personal data, intellectual property, financial records or other sensitive information. With the help of blockchain technology, a company can select what data should be released to other service providers, and what should be withheld. Companies can also limit any information access to a certain space of time before blocking it, or they can link access to other transactional triggers. There is mounting pressure on suppliers of all sorts of products and services to prove that they comply with fair trade policies, that they don't harm the environment and that they use ethical manufacturing methods. By using blockchain throughout the supply chain, an organisation has the ability to provide a consistent, truthful record of how each element of its service or product is being sourced. If a sustainable, ethical delivery is central to its competitive advantage, blockchain offers a way for an organisation to prove to customers that it complies with all the ethical standards set and that its suppliers do the same. Blockchain technology builds trust on several levels. It helps customers trust a brand, and a business to trust in its processes. By creating a tamper-safe, permanent record of contractual activities, organisations will always have an automatically populated history of events to refer to, which helps businesses to stay committed to their promises to clients as well as partners and suppliers. This will only ever become more important in today's marketplace. The New Business e-newsletter is free. Click here to start receiving the latest business advice and news.